Today, we are 45 days from Election Day 2016 – November 8, 2016. We celebrate YOU, for insuring that the voices of the church for not being SILENT. Mark your calendar, organize a listening party, and sign up for the Strategy Calls at WWW.AMEV-ALERT.ORG . Invite everyone you know with emails, texts, website, facebook, and tweets. Every Saturday in October at 1:00 pm (EDT); 12 noon (CDT); 11:00 am (MDT); 10:00 am (PDT). Remain encouraged and keep it moving forward!. Today, get ready for National Voter Registration Day – September 27th. Go online. Distribute Voter Registration Cards. Register at least 10 people. 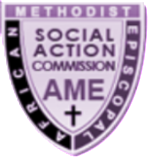 Tell ALL to Go to www.AMEV-ALERT.org to REGISTER TO VOTE and to get involved!! 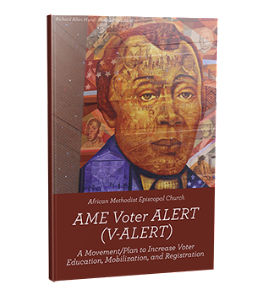 Today, Make AME V-Alert Toolkit your daily reading – share it with your church members, neighbors, co-workers, family, friends, and EVERYONE YOU MEET. It is your right to “sit this one out” and do nothing, but we urge you to do everything to make sure that every eligible voters Vote on or before Tuesday, November 8th.